For more Shadow Shots, click here. Posted on December 19, 2009, in my digital photos, my senryu, Shadow Shot Sunday. Bookmark the permalink. 29 Comments. Lovely shadow shot and lovely words, as always! Have a great weekend and holiday season! I love those old lamps and their stylish shades. The shadow resulting from this old lamp is a shadow of perhaps a UFO, or something floating without the aid of strings or wire. A great capture! Lots of shadows here, not only do we see the shadow of the lamp and blinds on the wall but a shadow from ouside on the lamp shade. All of it has a warm glow. Great capture. Why is his lamp dark? 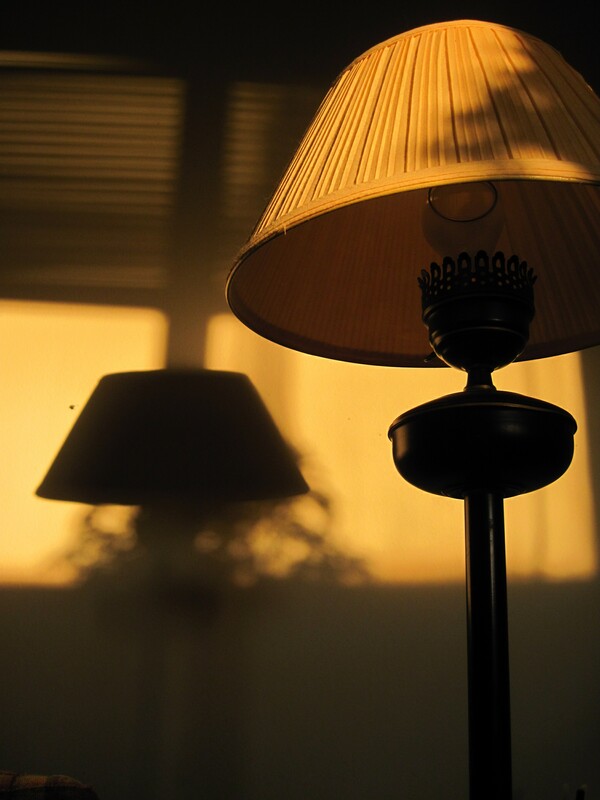 I really like the shadow under the lampshade shadow – what is it? In sight. Who will light the lamp? Could be D or P.
As the light slips by. Taken at the perfect time of the day – beautiful shot. Looks like a peaceful late afternoon shadow, time to relax in the easy chair and take a picture…have a wonderful holiday! I like the way that the lamp is already in shadow, and casting a shadow! Great message for the photo. I see so many shadows here ~ wonderful late afternoon capture. It looks like a cozy room in which to sit with a book and a cup of tea. Thanks for the visit and the poem. Beautiful glow coming from outside, lovely shadow shot and words. Beautiful. I love the warm colors. Great shadow of the lamp! Great haiku as always! Lovely lamp shadow and words. What a gorgeous shot! Love the warm tones and the beautiful glow of it. For some reason, it reminds me of summer! Very nice lamp shadows..love the composition!! this is so beautiful, love these shadows. I like the warm colors, we could use some warmth! Such delightful, subdued light tones round the shadow shapes! And thank you so much for the poetic response to my Christabella shadow! I so loved this one! We love all of the shadows here! Just look at them all- our eyes won’t stop! Thanks for all of your wonderful haikus this year – we’ve enjoyed every one!